Whether it likes it or not, Kaliber is the alcohol-free beer that all other alcohol-free beers are measured against. Launched in 1986, it wasn’t the first alcohol-free beer on the market. But it’s probably the most well known thanks to an 1980s advertising campaign featuring Billy Connolly and its status as many pubs’ standard non-alcoholic beer offering before Beck’s Blue came along. Nowadays it seems to be a beer that still sells itself, even though it has nothing like the near-monopoly it used to have on the non-alcoholic beer market. Guinness certainly aren’t throwing an advertising money its way – it’s not even mentioned on the Guinness website. 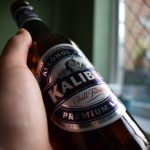 Despite its long history, I’d never tried Kaliber before. My only recollection of it is spotting a few bottles hiding on the bottom shelf of pub fridges. Anyway, it’s not exactly the coolest brand around is it? Which is perhaps why Guinness don’t make a song and dance about it. 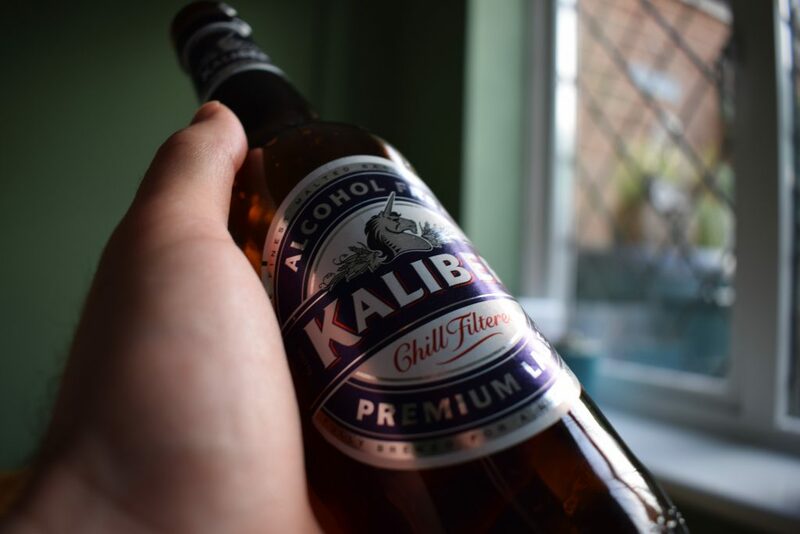 I’ve read that Kaliber has its alcohol removed after fermentation but it’s got a whiff of wortiness that says otherwise when you open the bottle. After pouring, the aroma turns even more savoury with hints of biscuit. Then there’s a soapy smell, which gets stronger and more obvious with each whiff and eventually takes over the other aromas. The mouthfeel is impressive but it left me with a syrupy coating on my tongue. It’s rather viscous, and more thick than you’d expect from a lager. Highly carbonated, there are tight bubbles that left me with a few burps post swig. There’s a savoury vibe to the taste too. 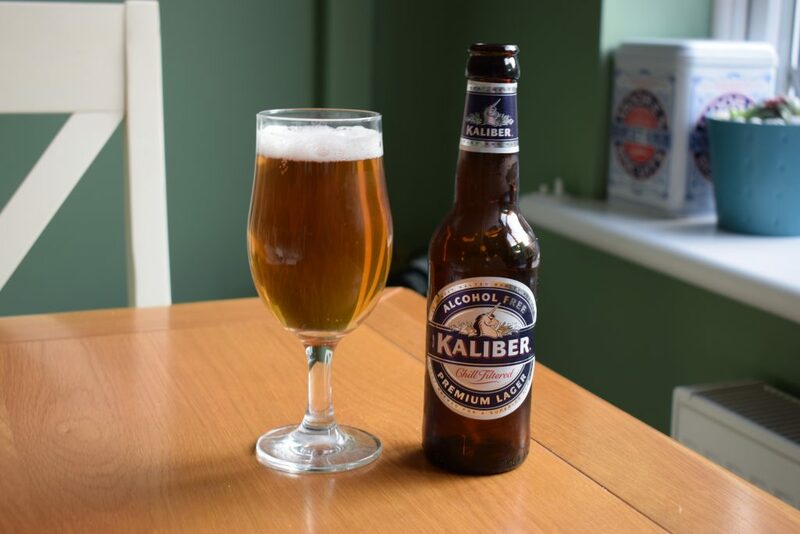 The wortiness continues with bready and caramel notes – few of the characteristics of a typical lager. There’s a sweetness in the flavour too. This gets too sickly after a few sips, despite the efforts of a little bitterness to balance things out. I can see why Kaliber has a bad reputation. It has good body and mouthfeel. But the flavour and aroma – with that soapiness that overpowers everything else – letting it down. Sign up to get reviews, articles, offers and discounts to your inbox. If you've found this website useful, please consider donating some cash to Society of St James, a charity that supports people who have issues with homelessness, drugs, alcohol and mental health. *If you buy something after you visit links marked with *, I might receive a small commission at no extra cost to you. †Reviews marked with † feature beers I didn't pay for (usually because the producers gave them to me for free). My aim is to review these beers the same as beers I've paid for but you may want to bear this in mind when reading the review. Find out more on my disclosures page. Steady Drinker is an independent website that helps you discover great low-alcohol and non-alcoholic beers and lagers (under 0.5% ABV) so you can cut down your alcohol intake. If you find the reviews and resources on the site useful, please consider donating some cash to Society of St James, a charity that supports people who have issues with homelessness, drugs, alcohol and mental health.